Stop for a moment and think of all the content your university manages across your digital channels. Every course description, news story, image, video, Facebook post, and tweet. Now think of how much it cost to produce that content. Does it represent a good return on investment? It should – great content has the power to attract, persuade, and recruit students. Unfortunately, when institutions create content with no clear plan or goals it can have the opposite effect. One study in the United States found that 1 in 10 high school students and their parents had eliminated a college or university from their list of potential schools due to a poor website experience. That’s where content strategy can help. A good content strategy plans for the creation, maintenance, and eventual retirement of content in line with your organisational objectives. It makes for content that is more effective, more measurable, and has a longer shelf life – increasing your return on investment. Content strategy makes for content that is more effective, more measurable, and has a longer shelf life – increasing your return on investment. 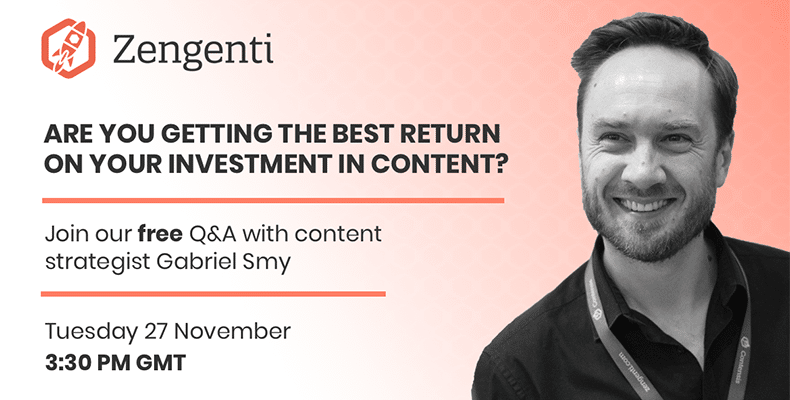 Gabriel Smy is a content strategist at Zengenti, the company behind the Contensis CMS used by leading universities such as the London School of Economics, King’s College London, and the University of Birmingham. Gabriel has over a decade’s worth of experience working with digital content for agencies and in-house teams. Recently he’s been using that experience to help universities to overhaul the way they manage content.